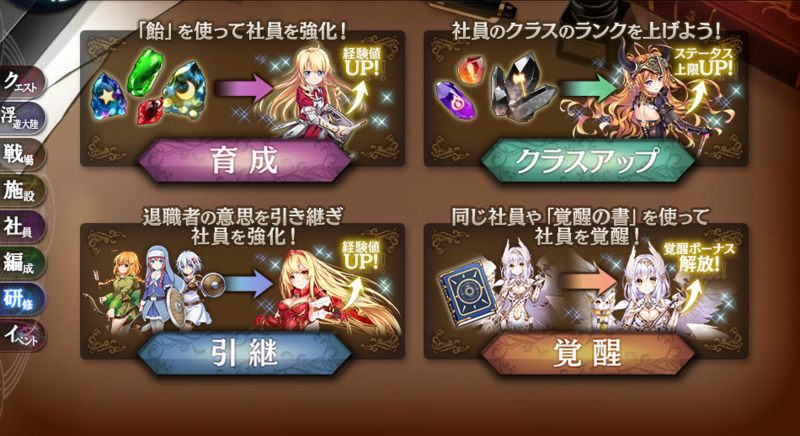 The Training Tab (研修, blue tab) now contains the options for Raising, Class Up, Inherit, and Awakening. On this screen, you can choose your currently not-fully awakened employees to awaken. Each awakening now gives a significantly higher amount of stats, and for all of the stats that full awakened employee previously gave. i.e. a Fighter will now gain STR+%, VIT+%, INT+%, and HP+ even with one awakening. You can choose another Employee to use for the awakening or choose items. The other Employee must be the same Employee. You will no longer gain EXP for awakening. Another currently locked feature will be unlocked in a future update. The 4/12 (Fri) update is planned to bring a renewed awakening functionality. The following improvements are planned. 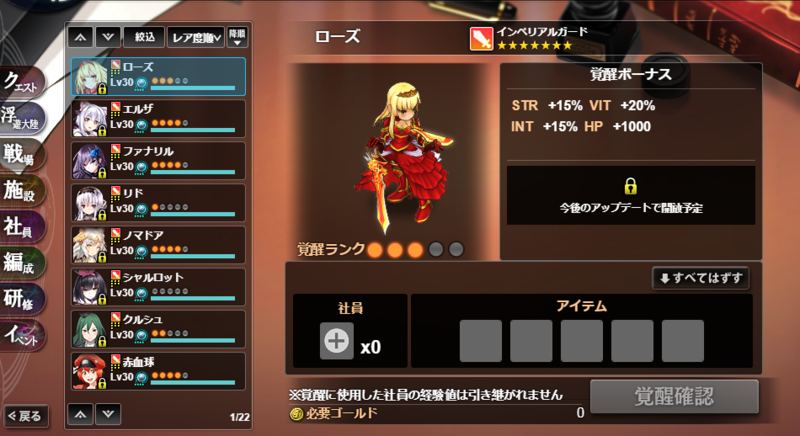 Employees will have [Awakening] and [Inherit] separated, with the [Awakening] UI made to be more easily usable. Rare item used exclusively for Employee Awakening instead of employees will become available. Up until now, awakenings gave specific status bonuses based on the number of awakenings. After the renewal, parameter bonuses will also be included. After the renewal, you will no longer be able to [Inherit] the same employees together. Employee [Awakening] will no longer give EXP. Players who wish to [Inherit] EXP between employees should complete their [Inherit] before the 4/12 (Fri) maintenance. With this awakening renewal, already awakened employees will keep gain the newly awakened statuses too. After the Awakening Renewal Part 1 release, Awakening Renewal Part 2 is expected to release next month. Last edited by Folseus; 04-13-2019 at 02:04 AM. Does this mean I should feed the clones now? Someone like Shion, that have good speed and hit like a truck however, I keep the dupes still. @ofi123 They were not very clear on what exactly they're doing, but the notice says you will not be able to inherit the same characters to one another. It's possible they'll allow you to turn a dupe into this new awakening item or something along those lines, but I have no idea. I'll be feeding my dupes together I guess. I see. Guess I'll feed my to keep the extra stat bonuses. Renew: separate takeover and awaken. takeover gets exp. awaken doesn't get exp. there will be 2 ways of awaken. Ok, thumbs up for this change. My bread production went up from 140 to 149 cause of the changes. @Mikan That's been there for a veeeeery long time.